These are a perfect addition to your fall product line - they smell and look amazing. You won't be able to keep these on the shelf! Measure ingredients with a scale or precise measuring tool. We are not responsible for the products you create from our supplies. NOTE: If you are making these products for sale, good manufacturing practices recommend you wear a hairnet, gloves and a mask. We also recommend a clean apron and workspace. To microwave-safe measuring up, add 10 oz. of cut up Clear Soap Base. Heat in microwave until the soap has completely melted. Add (3) micro scoops of Turkish Mocha Brown Mica Powder and stir well to blend. Pour a thin layer of soap into the Square Basic Silicone Mold, dividing soap between the 6 cavities. Spritz with alcohol and let harden. To microwave-safe measuring cup, and 30 oz. of cut up White Soap Base. Heat in microwave until the soap has completely melted. Pour about 1-2 oz. of melted soap into a plastic beaker. Add (5) micro scoops of Rose Gold Mica Powder and (7) micro scoops of Chocolate Brown Mica Powder. Mix well and add back to larger bowl. In a separate plastic beaker, mix 1 oz. of Pumpkin Coconut Cream Fragrance Oil with 0.50 oz. of Vanilla Color Stabilizer. Let sit for 2 minutes then mix into the melted brown soap. 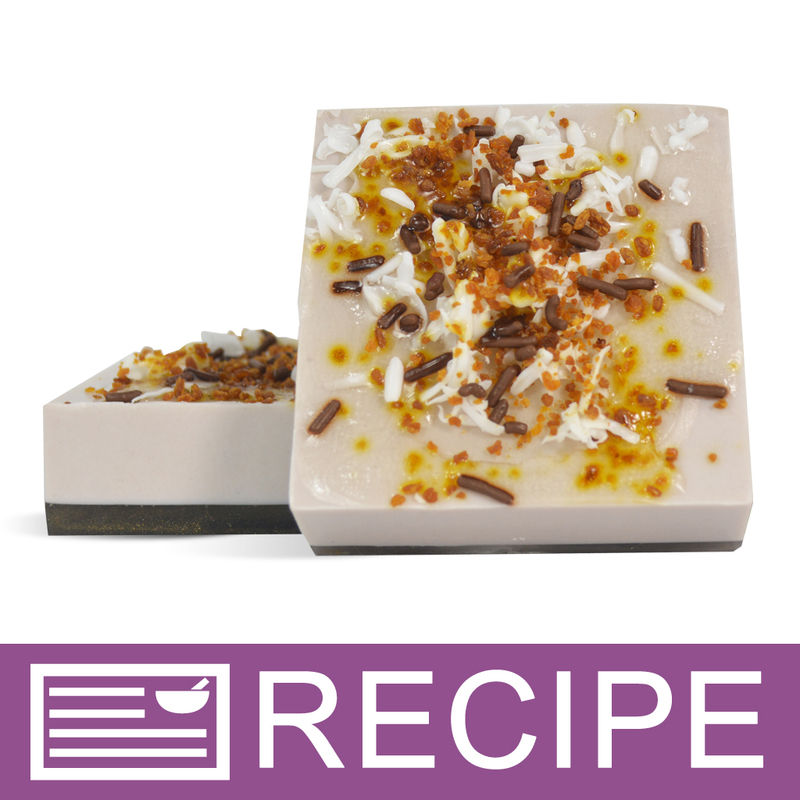 When the melted soap has cooled to around 130°F, spritz the top of the soap in the mold with rubbing alcohol. Pour the colored soap into each soap cavity leaving just a little room at the top. Spritz again with rubbing alcohol and let soap harden. Weigh 2 oz. of White Soap and make the coconut shavings by grating the soap with a grater. Set aside. In plastic beaker, melt 1 oz. of Clear Soap Base. 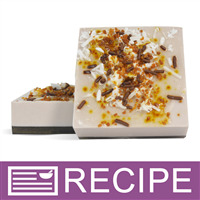 Spritz the tops of each soap bar with rubbing alcohol and divide the melted soap between the six soap bars. Sprinkle the tops with the "coconut shreds" and Chocolate Brown Candy Sprinkles. Melt another 1 oz. of Clear Soap Base and drizzle this over the top to hold the toppings in place. Let harden completely, then unmold and package as desired. To Use: Lather onto wet skin and rinse with warm water. 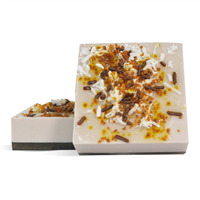 NOTE: Original soap pictured has pumpkin seed flakes sprinkled on the top. This product was discontinued in Jan. 2019 and was removed from the recipe. Ingredient Label: Sorbitol, Propylene Glycol, Sodium Laureth Sulfate, Stearic Acid, Myristic Acid, Water, Sodium Hydroxide, Sodium Cocoyl Isethionate, Titanium Dioxide, Fragrance, Mica, Tin Oxide, Iron Oxide, Candy Sprinkles.